The is the best new variety of Chex cereal to come out in the last 25 years. 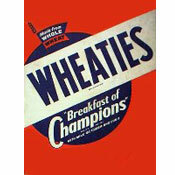 Honey Graham Chex (since discontinued) came out in 1986 and that was just a tinge better. The flavors taste very natural in Apple Cinnamon Chex. Every other piece of the cereal is sprinkled with apple powder and cinnamon. The other pieces are standard Rice Chex. I like that they took the every-other-piece approach. If there was any more apple flavor, it would be too in-your-face. This more subtile approach lets you appreciate the simplicity that most people love about regular Chex cereals: its light crunch and the natural goodness of simple ingredients. Some other recent Chex varieties tasted a bit artificial. Both Chocolate Chex (2007) and Strawberry Chex (2008) felt like they had to force flavors into the cereal pieces. This Apple Cinnamon variety tastes more natural, almost home-baked. Nutritional Considerations: Each gluten-free 3/4 cup serving has 130 calories, 2 grams total fat (0 saturated and 0 trans), 0 mg cholesterol, 190 mg sodium, 25 grams total carbs, less than 1 gram dietary fiber, 8 grams sugar and 1 gram protein. 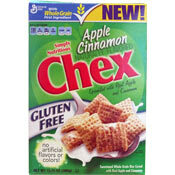 What do you think of Apple Cinnamon Chex? Now see, I though this one was much too cloyingly sweet with way too much flavor powder on the pieces. I actually didn't even realize that only every other piece was flavored, it was so overwhelming. I agree that nothing has come lose to Honey Graham Chex - that was the one with little graham cracker pieces mixed in, right? Yup, that one rocked and I wish they'd bring it back. Honey Nut and plain ol' Corn are my favorite Chex varieties.